Whatever your parents have, will ultimately be yours! Kanchan felt those words cutting through her heart like a dagger. It was not the first time that Vikas said all this. It has been two years to their wedding and she heard all this quite often and she always kept quite because somehow, Vikas made it all seem right. Plus she also didn’t want to fight with Vikas over all these lame issues. After all he was right. Her parents were rich and buying her a flat or that diamond set that she liked and Vikas sent the pictures to her mother, without telling her and her mother transferred the money to Vikas’s account and Vikas bought that set for her on their first anniversary. She came to know about it much later that Vikas took the money from her mother and promised to return it but never did. Or that trip to London. When Vikas was going to London for some office project for 10 days and Kanchan wanted to go too. What will she do here alone anyways and they were newly married and wanted to spend time with each other and her father booked Kanchan’s ticket because Vikas couldn’t afford a return ticket on such short notice, but he wanted Kanchan to go with her, so he told her father and he happily booked the tickets and transferred money in his account for shopping too. Or that new furniture or fridge or down payment for a property in Delhi. Vikas always took money from her parents on a promise to return, but he never did and her parents never asked for the money because they wanted Kanchan to be happy. But money can’t buy happiness. She looked around her house. Ninety percent of things in this house were given to her by her parents. She was not sure how long this will go on and she hated to take money from her parents. She was always an independant girl who made her own money, from a very young age and never took help from her parents. Her parents always taught her to be financially independant and have self respect. When she met Vikas at an office event, she thought he was a man with values and strong convincing power, that is the reason he won all the awards in the Marketing and Sales department every year. He was a man of words. The way he presented himself, Kanchan was impressed and fell in his trap. Vikas knew she was from a rich family, while Vikas’s father was a clerk in the Income Tax department. He lived with a joint family, in a small government quarter, all his life and Kanchan’s big house and even bigger car, her carefree attitude, her lifestyle, her beauty and dressing sense, everything about her impressed him and he managed her to fall in love with him and finally marry him. He knew his life was going to change and it did. First he bought the house and then he furnished the entire house in the most luxurious way. Then he bought a big car and many foreign trips in just two years of marriage. He loved Kanchan very much. She was a very nice girl who respected his family and took genuine care of his parents. But all this was secondary to him. He was always ambitious and he felt suffocated in the house he lived all his life. His dreams were big and he wanted to achieve much more and Kanchan was the key to all his dreams. He always kept her happy and pampered. Kanchan understood now but she felt helpless. She touched her grown belly. It was just two more months and the baby will come. She wondered how much her parents still have to pay after the baby comes. A tear ran down her cheeks and fell on her belly. She knew what she had to do. She went inside the room and started to pack her bag. She didn’t want her baby to be like father. Hello my lovely ladies! Leave your comments about your thoughts on this article. Also follow me here and to know more about me follow me on Instagram and Facebook too. Waiting to read from you guys. Posted on July 24, 2018 July 24, 2018 Categories husband wife marriage oldage together family love children life, lifelessons, life, relationship, mother, pregnancy, new born, children, love, life, family, life lessons, relationship, new mother, marriage, parent, parenting, children, kids, parenting tipsTags bride, children, family, husband, life, lifelessons, losing, love, modern, mother, mother in law, parenting, parents, partner, relationship, women1 Comment on Whatever your parents have, will ultimately be yours! Bagpack mom : “Mom can I have a snack?” “Yes honey here you go”. “Mom I need fresh watermelon juice.” Takes out watermelon from the bag. Mixer. Strainer. “Here, honey”. “That lady has so many yummy eatables in lunchbox. But if I befriend her, I’ll eat and become fat like her”. What is it like being a mother? The first thought of being a mother was more scary than happy. The decision itself was very tough. I had to give up a lot. A lot that I loved. A lot that mattered to me. My freedom, my space, my career, my sleep, my love, my body,my whole life was about to change. But the pressure from the family and the ticking biological clock made me take the decision. But there was always a feeling of doubt. what if I won’t be a good mother? what if I fail to raise the child in a proper way? what if … there were many ‘what if’s’ and I searched and searched but couldn’t find the maternal instinct within me. So I gave up and just went with the flow, thinking, we’ll cross the bridge when we’ll come to it. The first three months were miserable. Morning sickness took the most of me and stayed with me until night and nausea was literally a part of my life. I couldn’t bear the smell of food being cooked in the kitchen. Few of my favourite recipes were enemies now. Couldn’t bear them in my eyes and nose range. Was this how I am going to be for next 9 months? I once fainted while shopping. So was prohibited from going to the mall too. I hated my life and my husband more for putting me in this situation. Nothing happened to him. He can go where he wants, eat what he wants, wear what he likes. First trimester passed and things started getting a little better. Nausea was gone but it was replaced by pain in the back and swelling in the feet. It got difficult to sit and to stand and to move and to pick something from the floor. I needed help all the time. The maternal instincts were still missing but yes when something moved or kicked inside the stomach, there was some feeling, I can’t give a name to. It wasn’t happiness, it wasn’t pain, it wasn’t anger. It was something I could not figure out. Numerous medicines and endless tests kept me at the end of my wit. I was mostly in foul mood. But everyone around me took care and was sympathetic towards me. Nine months passed and I got more nervous as the delivery date came closer. All the stories ever heard from my friends and relatives about how painful it is to give birth to a child gave me nightmares. But I also wanted to get it over with. I waited and prayed for an easy delivery. The day finally came and I experienced the first contraction. And trust me, it was nothing like everyone said. It was much more than that. I thought I will never make it. I will die giving birth to this baby. My water broke and we rushed to the hospital. The doctor checked and told me it’s not time yet and they admitted me in the hospital. I was asked to do some breathing exercises, massage and have a warm bath or shower, as it will help ease pain during this early stage of labour. The pain was immense and after 10 hours from getting admitted in the hospital and a near death experience, I gave birth to a baby boy. I just saw his face and while the doctors took him away to clean him up, I made a promise to myself to not do it again, I was so relieved that the pain was gone that I slept. 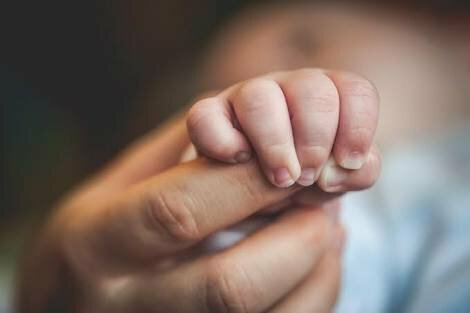 After I woke up, I was given this small bundle ,and the moment ,I ,with a lot of hesitation, took him in my arms, all the worries, pain, confusion, sickness, sadness, moodswing, all of it was long forgotten. All I could see was this baby that I gave birth to. Everything around us went into a blur. His small fingers were wrapped around my finger tightly. I touched his nose and he moved a little. He was sleeping in my arms. I gave him a gentle peck on the cheek and he opened his eyes and looked right at me. That was the moment I will never forget when we looked at each other for the first time and I became a “mother”. I knew I can never love anyone or anything more. My hidden maternal instincts were right there and I was all protective and loving and caring as a mother could be. I had a piece of me in my arms. A piece of my body and heart. A piece of my soul. He was inside my body just for nine months but he will stay in my heart forever….and ever…till the day I die. Posted on September 19, 2017 October 31, 2017 Categories mother, pregnancy, new born, children, love, life, family, life lessons, relationship, new mother, marriageTags children, family, love, mother20 Comments on Maternal Instinct! “We are looking for a well educated, modern and preferably working bride for our son.” These were the words that made me feel lighter in the stomach when Sushil came to see me with his mother and father. Those knots were gone and just these few words made me feel better. I looked at him for the first time. Our eyes met and something just clicked. There was a moment. There’s not so much wrong with arranged marriages after all. Wedding was a tiring affair and then a slip to the mountains for our honeymoon was blissful and endearing. I had taken good one month off from the office to get done with the wedding and settle down at the house, and I didn’t wanted this one month to be over. Sushil’s mother was pretty helpful and she took good care of me after the wedding. I was so lucky to have such a mother in law. The relatives had started to pour in to our house to meet and greet the new bride. I was in my room chilling when my mother in law came to ask me to get ready for the first meet and greet. “Rina wear a saree and put on some make up. Also wear the jewellery your father gave you. Quickly get ready and come down. People are here to meet you.” It was a task to change into a heavy saree in this june weather from a pretty cotton salwar kameej i was wearing. Anyways the relatives met me and treated me as if I was some statue in a museum, some garment up for sale so they were touchng me and feeling the fabric. They touched my golden hair and asked me if they were natural. I couldn’t wait for them to leave more because I wanted to get out of this heavy saree. Months after the wedding passed in a blink. Sushil and me were having a good time. We both were getting to know each other better with every passing day. We went out on weekends and during weekdays we were constantly in touch all day. Its been four years to my wedding and when I look into the mirror all I can see is a pregnant housewife who is a mother of two daughters, pregnant again hoping for a boy this time.